As the protests continue in Ferguson, Missouri, over the shooting of Michael Brown, we turn now to two well-known voices who have come to Ferguson to show their support. Talib Kweli is a world-renowned hip-hop artist and activist from New York City. He first broke out as one half of the duo Black Star, along with the rapper and actor Mos Def. Black Star helped define the underground, conscious hip-hop movement that re-emerged in the late 1990s. Since then he has released many critically acclaimed albums and used his platform to champion political causes, including police brutality and the prison-industrial complex. 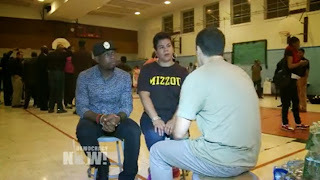 Kweli traveled to Ferguson with Rosa Clemente, a longtime activist, journalist, scholar, and former director of the Hip-Hop Caucus. In 2008, Clemente made history as part of the first all-women-of-color presidential ticket in U.S. history, running as the Green Party’s vice presidential nominee, along with former Democratic Rep. Cynthia McKinney, who ran for president. Kweli and Clemente joined the protests in Ferguson just before a massive march planned for Saturday in their hometown of New York City. Thousands are expected to rally on Staten Island for justice in the case of Eric Garner, the African-American man who died in a police chokehold last month. Democracy Now! producer Aaron Maté caught up with Kweli and Clemente this week at Ferguson’s Greater St. Mark Family Church. The church has been used as a meeting point and as a safe haven for protesters hit by tear gas. Watch complete coverage of the Michael Brown shooting and protests in Ferguson and around the United States in the Democracy Now! archive: http://www.democracynow.org/topics/mi... Democracy Now!, is an independent global news hour that airs weekdays on 1,200+ TV and radio stations Monday through Friday. Watch our livestream 8-9am ET at http://democracynow.org.